Who hasn’t had weeks or days like this? When it seems that everything that can go wrong does. When every item that lands on your plate is a challenge to your ethics or your knowledge or your compassion. When your plans are derailed time and again by forces outside your control: the weather, mechanical difficulties, other people. At times such as these we have few options other than to just do our best as we find a way through. Even though objectively I know I can only do my best as each challenge presents itself, subjectively many times my best feels woefully inadequate. So when I came across the quote, above, from author Cynthia Ozick, it seemed like a good idea to take a few minutes in the midst of this week to be grateful for some of the things I take for granted. 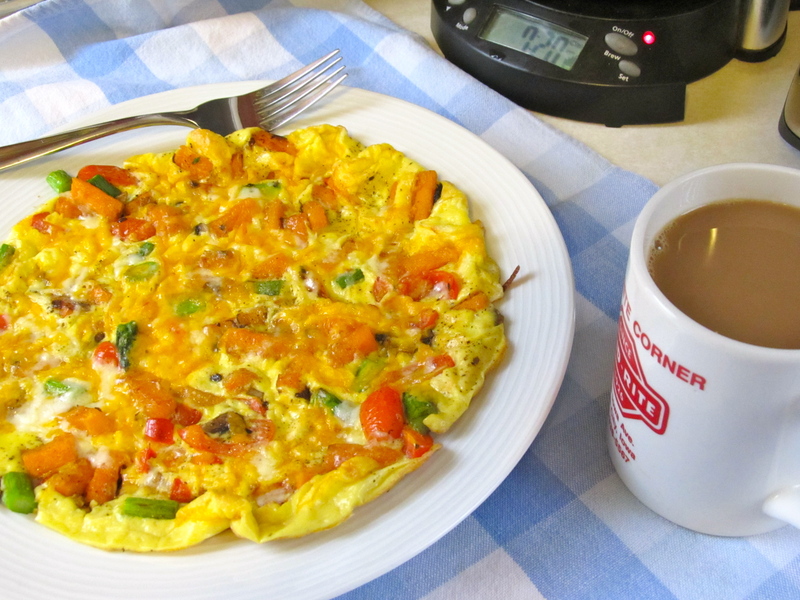 Healthy, fresh food: This was my Sunday brunch, a frittata made with sweet potatoes, asparagus, onion, grape tomatoes, mushrooms, cheese and eggs. With a rich cup of French roast coffee to wash it down, of course! When I stop to think about the fact that I have both the means and the access to acquire the freshest, healthiest ingredients – and how many people in this country, this world, don’t – I am truly humbled and grateful. At the same time, if I really think about this, I am also energized to find ways for all people to have this simple abundance. 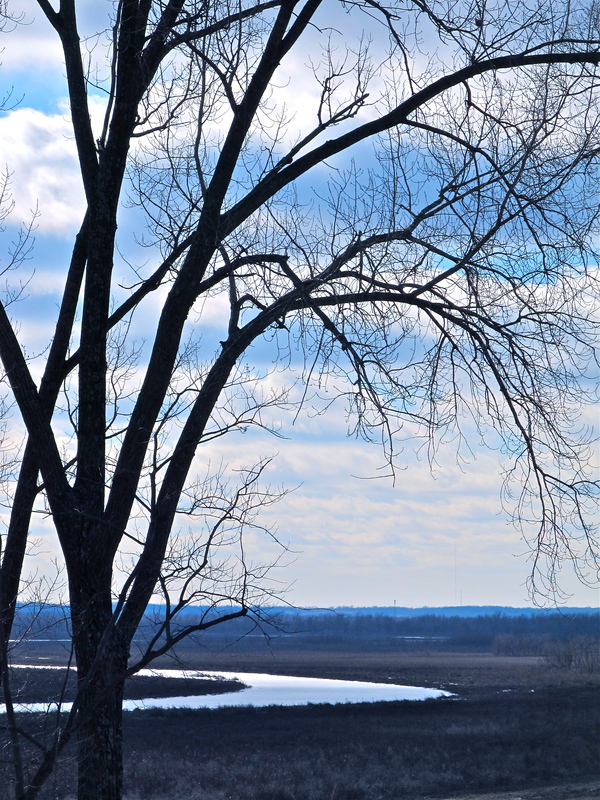 Natural beauty, even in winter: This photo of the Cedar River was taken in February on a day when I just needed to have a calming moment of stillness. I drove out to a rural access point, and spent a while just gazing at nature (mostly from inside my car, as the temps were dropping rapidly that afternoon). I have, only lately, come to appreciate nature and its direct impact on my mood. It seems miraculous to me that we live in a world where such beauty is, literally, just around the corner. Kindred spirits: On a recent trip to sunny Florida, I optimistically wore sandals to the airport, despite the bitingly cold wind here. I knew it would be in the high 70s when we arrived at our destination. My friend, Molly, saw my toes and asked if I had recently had a pedicure, which I had. Turns out, so had she – and we had selected the same shade of sparkly orange polish! One of the things I value greatly about my friends is that we are all so different from one another – in age, temperament, experiences – yet on a level deep beneath the skin we “get” each other. The love and respect inherent in these friendships with my kindred spirits is such a gift – one that I rely on heavily in difficult times. Sometimes, it is hard not to take them for granted due to the ease and natural fit of our friendship. I need to remember that my friends and family are people to treat with true appreciation on a daily basis, as that is how often they lighten the burden and increase my joy in life. Sunshine: It is March. In Iowa. Every moment of sunshine is a little miracle that needs to be appreciated. 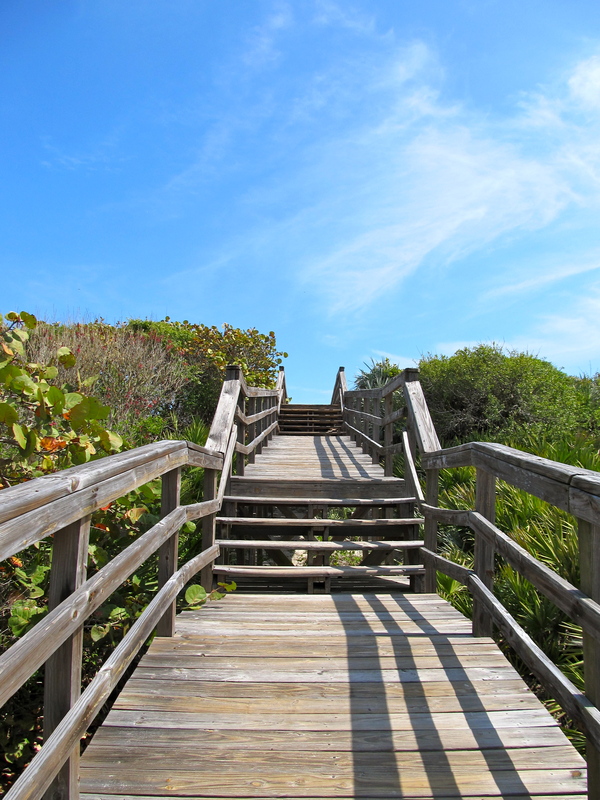 Serendipity: It just so happened that I arrived at the Merritt Island Bird Sanctuary on the morning after something or someone had trashed the bird feeders next to the observation deck, spilling the bird seed on the ground and offering a veritable feast for a variety of species. 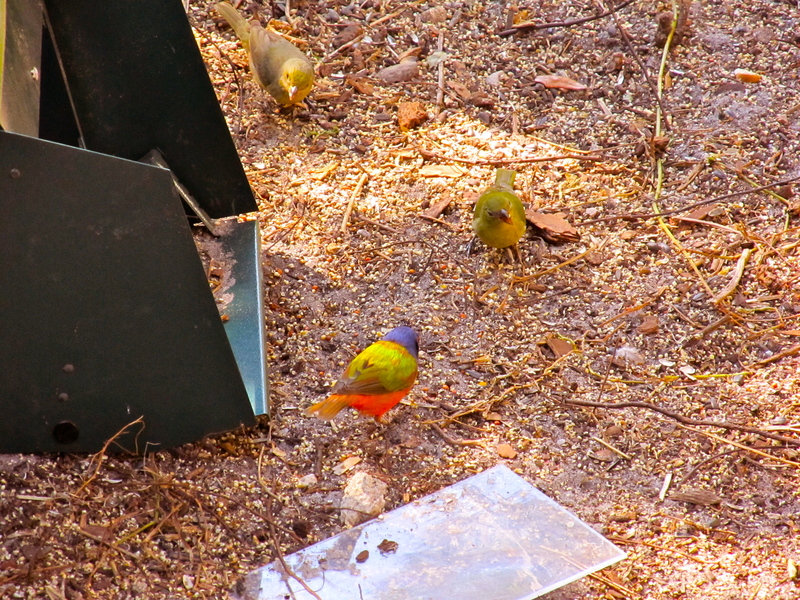 Including these painted buntings – which the volunteer at the sanctuary informed us were a rare sight. Another example of serendipity: my friend Wendy gave me a gift certificate for a 60-minute massage (she gave it to me for my birthday in July). I realized several weeks ago that the certificate expired at the end of March, and scheduled the first available evening appointment – which was last night. Not knowing, at the time I scheduled the appointment, what would be happening this week, the massage could not have come at a better time. Appreciating these moments when the confluence of events creates just the right and needed experience to salve my soul is an important form of gratitude. These are the moments that remind me that all good things come as gift and grace, rather than through my own deserving. Simple Silliness: I tend toward the serious most days. My work involves people and their life issues, which are serious business. When moments arrive which allow the freedom of letting go of all that seriousness, it is a big deal to let go and relax into them. 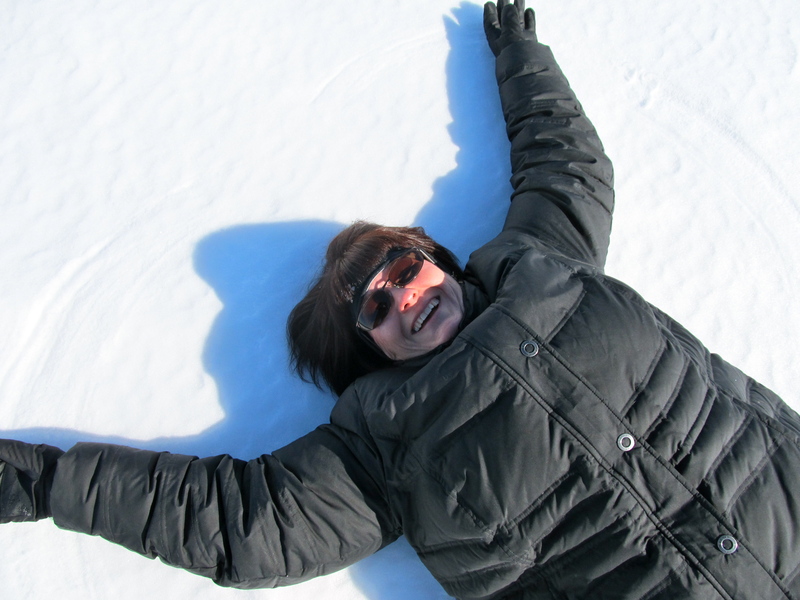 I love that Mike captured this photo of me engaging, with silly abandon, in a misguided attempt to make a snow angel on the hard, crusted snow covering Lake Calhoun in Minneapolis a few weeks ago. So, there are six things that I tend to take for granted which are richly deserving of gratitude. There are many more – education, clean water, fresh air, family – the list may, in fact, be endless. Endless, because I suspect the truth is that gratitude should be the center from which I live into each moment of this precious life I’ve been given. Each moment experienced as gift – I wonder how that would change my perceptions? My interactions? My creativity and flexibility when faced with life’s challenging and emotionally depleting days? What if I could also add my own imperfections to the list of items I am grateful for? Wow, that would likely be a game-changer. Imagine saying, “Thank you for my fear.” “Thank you for my confusion.” “Thank you for my flawed nature.” Hmmm. That, my friends, may be fodder for another post! Note: I invite you to share in the comments some thing(s) you take for granted but would like to be grateful for – I would love to hear your thoughts! You can find my entry in this week’s photo challenge on the photography blog I share with Michael R. Beck, at http://theviewfromtwocities.wordpress.com/2012/11/27/weekly-photo-challenge-thankful-jenifer/. Hope you enjoy! 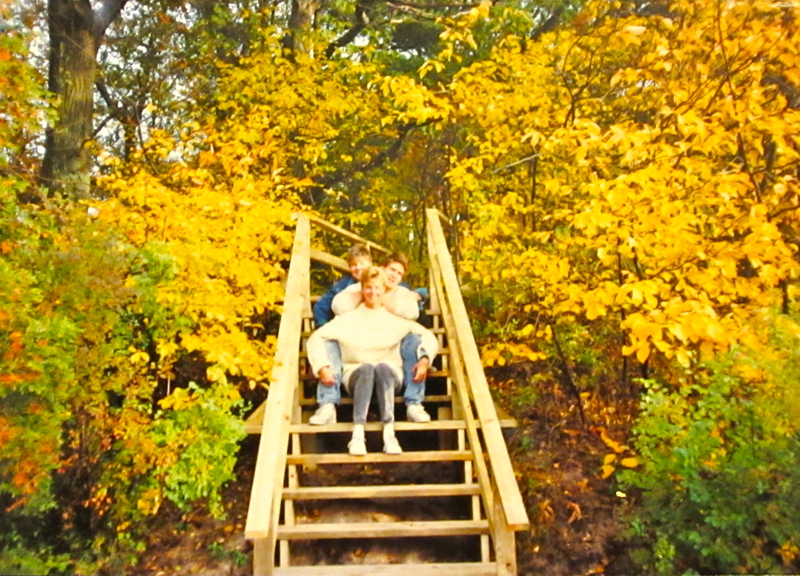 One of my favorite fall excursions took place in the late 1980s (88, 89 or even 1990) when my friend, Sue and I drove from Iowa to Michigan. There we met Chris (our friend from grad school) and Shawn (their friend from summers working at camp) at the American Youth Foundation’s Camp Miniwanca in Michigan. 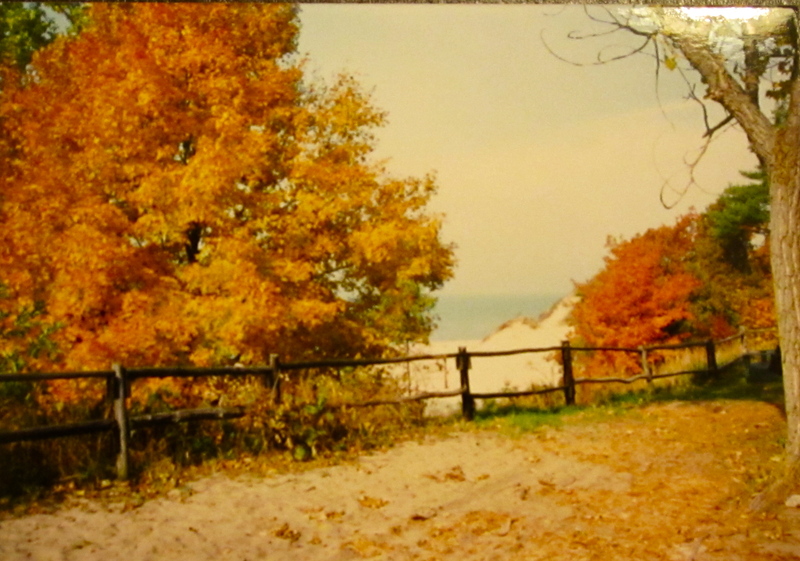 The camp, situated on sand dunes right on Lake Michigan, was breathtaking in its fall colors. 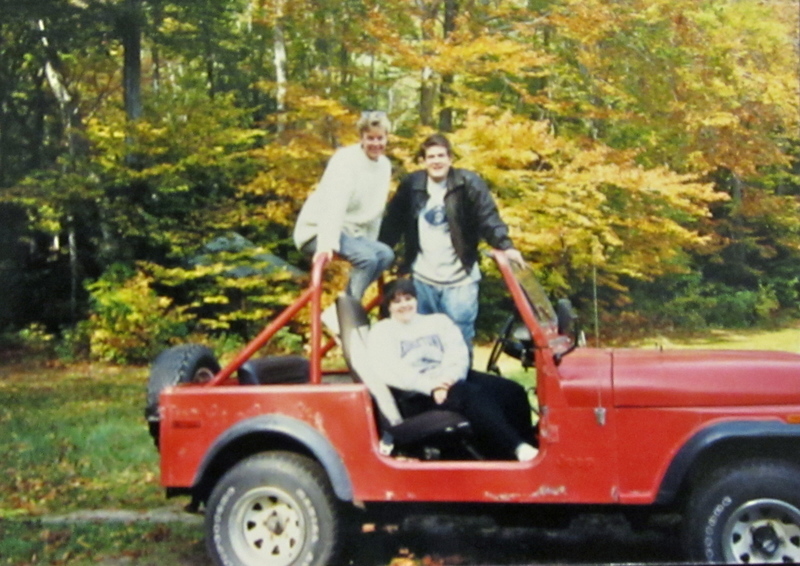 We spent the days sightseeing and tooling around the area in Shawn’s red jeep. It was perfect sweatshirt weather. We spent the night on the beach – literally. Blankets, not sleeping bags, directly on the sand. It would be safe to say that not a lot of actual sleep happened. But there was just no way we could bring ourselves to leave the camp fire and the moon, lighting a path across the lake, to head indoors to spend the night on musty camp cots. Needless to say, the morning was a little rough. The weekend was one of those moments in life that stands out as unlike anything else you’ve done. This particular group of four people was only ever together that one time. 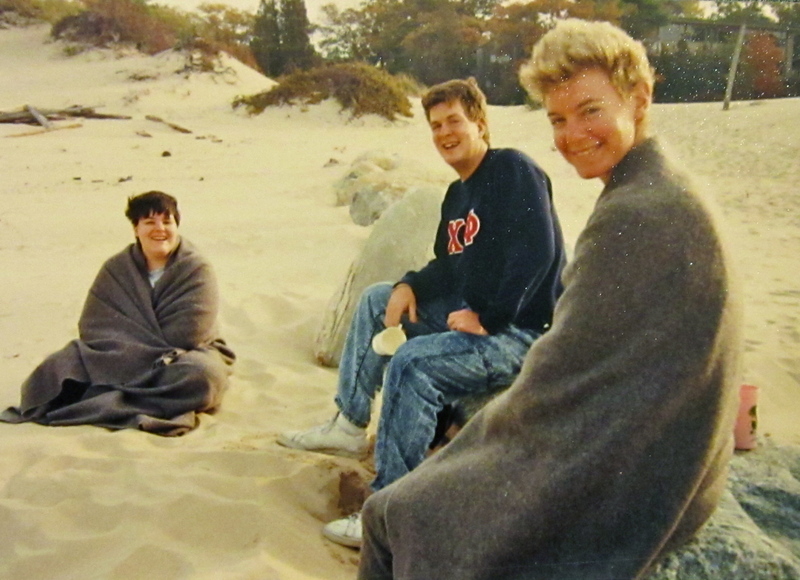 We were only ever at a deserted summer camp in fall that one time. As a trip, it wasn’t meaningful or important in the way some events are – your first trip overseas, or a family reunion to celebrate a 50th anniversary, for example. It was an idea that we all acted upon, unlike so many impulses in life. The times when you think, “Wouldn’t it be fun to…” then you just stay home. For whatever reason, this time we didn’t just stay home. And that decision to act rather than not act, was completely rewarded. 8:15 a.m. Friday morning, July 29, 2011. My friend and training partner, Sarah, and I crested a hill on Highway 6, outside of Grinnell, Iowa. Morning fog was just burning off the cornfields covering the rolling hills which spread off in every direction. We looked at each other, grinning, but also misty-eyed. A brightly colored river of people on bicycles, its current weaving and undulating, was visible for miles ahead on the pavement that lay before us. We were finally riding on RAGBRAI! For every rider on RAGBRAI, there are two narratives: one that is purely individual and another which is all about community. The individual narrative is about the motivation, preparation, and determination required to successfully complete what can be a physically grueling test of endurance (even for someone, like me, only riding one 75 mile day of the week-long event). In all of my training rides, every mile I rode leading up to that morning’s start in Grinnell, I thought that this individual story was the story. I was completely inside my own head. Had I progressed far enough away from the 350+ pound sedentary couch potato I once was to successfully complete this challenge? At 50? For me, this individual story is an important one – but it pales by comparison to the other narrative – the one about community that took me by surprise and brought me to tears numerous times throughout the day. The second story began at 5:16 a.m. when I was standing in my driveway, in my bike shorts and Mustang jersey, trying not to freak out because my ride and the other bicyclist embarking with us, weren’t there yet. Then I heard a honking horn and my friends, Layne and Kristen, shouting “Yeah, Mustangs! RAGBRAI here we come! Woo Hoo!” Did my neighbors appreciate this serenade? Doubtful. But it brought a smile to my face. We loaded my stuff, and my friend Tricia’s, into the back of the borrowed pickup truck, then rendezvoused with the two other trucks loaded with our team and their bikes. Once we arrived in Grinnell via gravel roads (the main access to town was blocked due to RAGBRAI), it was time to wipe off the road dust, pump up the tires, and meet the rest of “Team Mustang” at the park in town. Before leaving the park, our “road crew” got out the sharpie markers and wrote on our legs, telling the other 10,000 riders that I was celebration turning 50. Talk about a birthday celebration – nothing like having hundreds of birthday wishes shouted to you by passing strangers! Anyway, at 8:02, it was time to mount up and take off. We rode through town to the cheers and well-wishes of Grinnell’s citizens. There are so many details of that day etched in my mind. I would love to share them all, but in the interest of time, I will share those which most illuminate the story about community. My friends Colette, Wendy and Tricia chose to participate on the ride primarily to join me in the celebration of my birthday. They, too, have their own individual narratives about the ride, but I know that they chose to put themselves through the experience in support of me. Sarah spent countless hours with me, the slow-but- slowly-improving rider, leading up to the day. While we were separated on the road, it helped to know that, somewhere in that sea of polyester and spandex, were people who love me. We met up with our support team again in Marengo (the halfway point) for lunch and some much needed companionship – not to mention rest. I was daunted by the morning’s ride. Not ready in any way to give up, but very unsure if I had the reserves to finish the day. Truthfully, after the initial happiness of seeing the group together again, we were all a bit sober – having discovered that the day would be harder than we anticipated. But the hour we spent, eating and laughing on a stranger’s front lawn, reminded us that we were in it together, no matter how alone we necessarily were in pedaling our bikes. We left Marengo in a pack of matching blue and gold jerseys, to the cries of “Go Mustangs” from passing cyclists. After lunch, I lost Tricia, who had been my riding partner most of the morning. I rode the entire first leg of the afternoon on my own. The road from Marengo to Homestead, Amanas, was a long, flat one. It wound through a valley so beautiful that I could not believe my good fortune – no hills AND the best of Iowa to look at! My spirits lifted, and I was so overcome by gratitude, I pulled out my phone and called my parents in New Mexico just to tell them how amazing it was. I wanted my Dad to know that we were right, back in 1978 – RAGBRAI is the coolest thing ever! Heading into Homestead was a long hill, but I could hardly complain after the miles of flat terrain just completed. I shifted into low gear and took as long as I needed to crest the hill. Just as I did, my phone rang – my friends were in Homestead and waiting for me in the beer tent! In front of the concession tents were hundreds, maybe thousands, of bikes. Some were very expensive, most had bags attached crammed with valuable items for the ride. Not one was locked. Such was the community feeling. The party in the beer tent was one of the happiest I’ve ever participated in. Not one person looked anything but sweaty, dirty, tired and completely exuberant. As the Mustang team congregated, the live band performed “Mustang Sally” for us. Amid the dancing and cheering, every 50 year old woman in the tent found me to wish me a happy birthday and offer me a drink (which I politely declined because I don’t trust myself to drink and ride). Serendipitously, I literally ran into a college friend, Sue Sweeney, whom I hadn’t seen in 30 years. But it was the hugs and congratulations of my teammates and friends that put joy in my heart. When Ryan Scheckel, who had been sleeping off the effects of the previous day’s ride (and party) finally caught up with us, proudly wearing his Mustang jersey, I thought the day was complete. Except that we still had 25 miles to go. And the final 17 were expected to be the hardest, with over 1,000 feet of uphill climb. 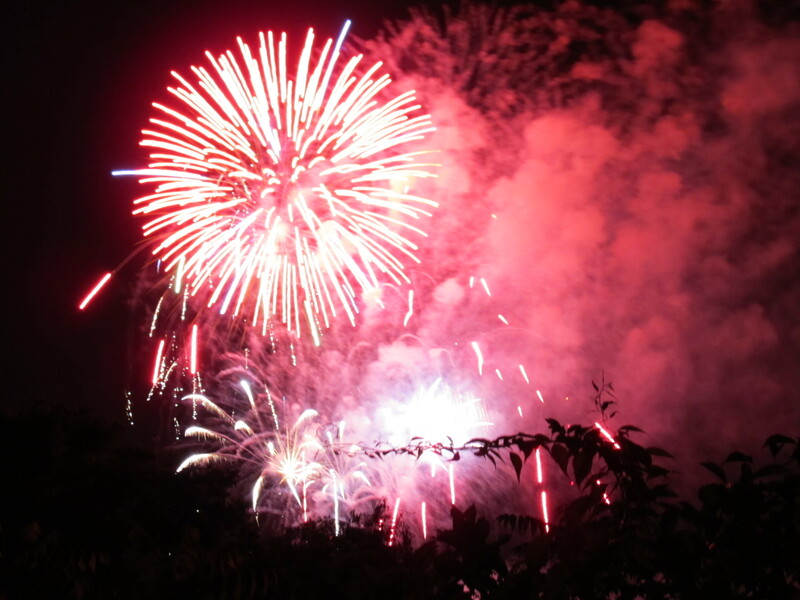 Discovery and Rediscovery: Notes on the Best 4th of July Ever! Reunions with high school and college friends and their families. 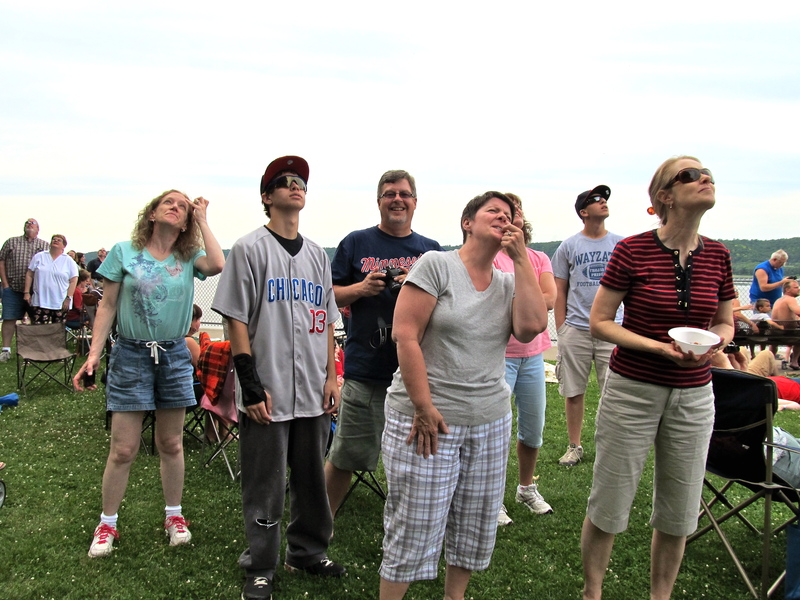 Airshow, fireworks, and sparklers with various combinations of children and adults from the above. 64 miles of bikeriding on unpaved trails. A family reunion in rural Maquoketa, IA. Discovery: Any place, including an apartment in an assisted-living retirement facility, can feel like home if the right people are assembled there. Rediscovery: The joy of singing. Most especially songs originally written and/or performed by John Denver. With friends and guitar accompaniment. When no one cares whether you can carry the tune, hit the notes, find your range. Discovery: That the happiness of reunions can be enhanced by including people who weren’t part of the original group. Betts, Mary’s partner; Ruth, Sheila’s 88 year old fireball of a mother; my dear friend Sue, who brought Lori whom none of us knew…not to mention the children of those we remember as (almost) children themselves! Rediscovery: Dubuque’s Eagle Point Park is one of the most beautiful places I’ve spent time. It would hold up by comparison to many much more famous spots. Some very special memories, from early childhood through Saturday’s air show and picnic, reside there. Discovery: Turning 50 doesn’t feel that strange when the friends surrounding you are that old, too! 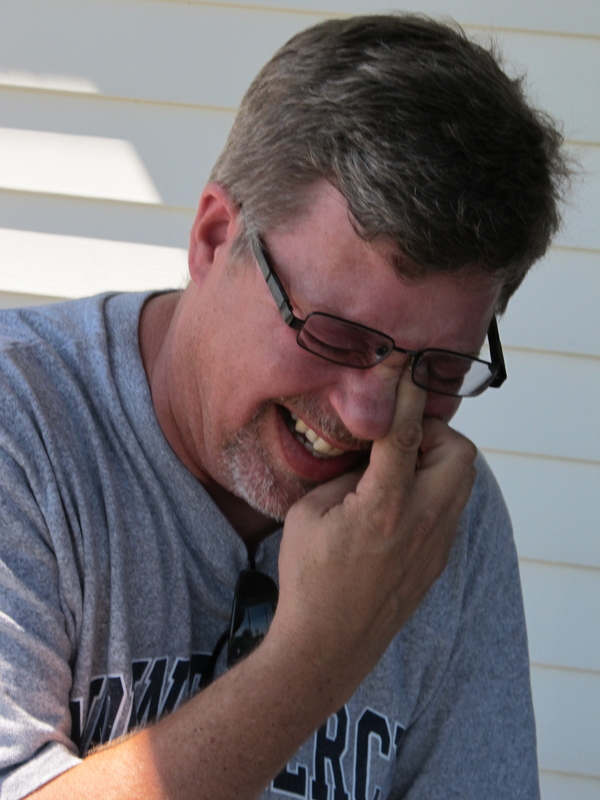 Rediscovery: A group of cousins may be able to laugh harder and have more fun than just about any other grouping of people. Discovery: A family reunion full of people you are completely unrelated to can be very fun – especially when the family that invited you is uniformly warm and welcoming, whether they’re meeting you for the first time or the first time in 30 years. It all started with a vague plan that a bunch of us would get together for parts of the weekend. Then, as the date approached, and plans became more concrete, I spent a moment or two wondering just how the groups and various events would work – would the people gel or would there be uncomfortable silences and people making every effort to maintain distance from those they didn’t know? I needn’t have spent one moment worrying. After all, at the core of the plan: friendships which have endured in spite of years and distance. Branching out from that core, were some of the people these friends love best in the world. Each event and permutation of the group worked. How could it have gone otherwise?! 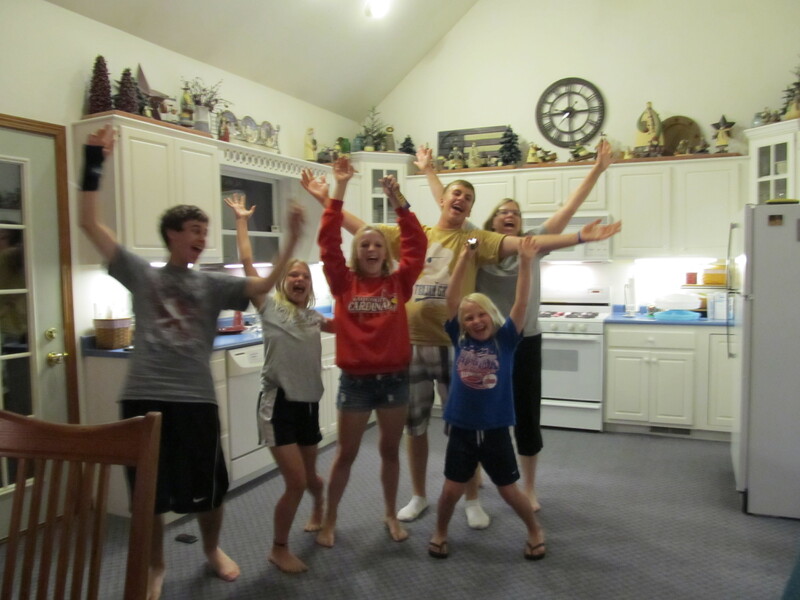 Surprisingly, it was one of the teenage boys (initially dragged along against his will, I’m told) who declared, late on Monday night, that this was the “best 4th of July EVER!” And it was. I follow National Geographic on Twitter. Just as has always been true of their magazine, they publish amazing snapshots, including this photo (click link, at site go to April Week 3, sunflower photo April 12) of a sunflower in mid-bloom. When I saw this, it seemed such an apt metaphor for so many things: those moments when we are on the cusp of something new, when we are being born into a new self – whether that is due to a new perspective, a new relationship, a flowering of potential we’ve carried within and are now expressing. Tuesday, it seemed the metaphor for an unplanned moment of revelation. We were to have a speaker for a motivational presentation at 9:00 a.m. Unfortunately, our speaker woke with a fever and was forced to cancel. There wasn’t time to call off the event, so we regrouped with the ten or so people in attendance and asked them to share what inspires them. 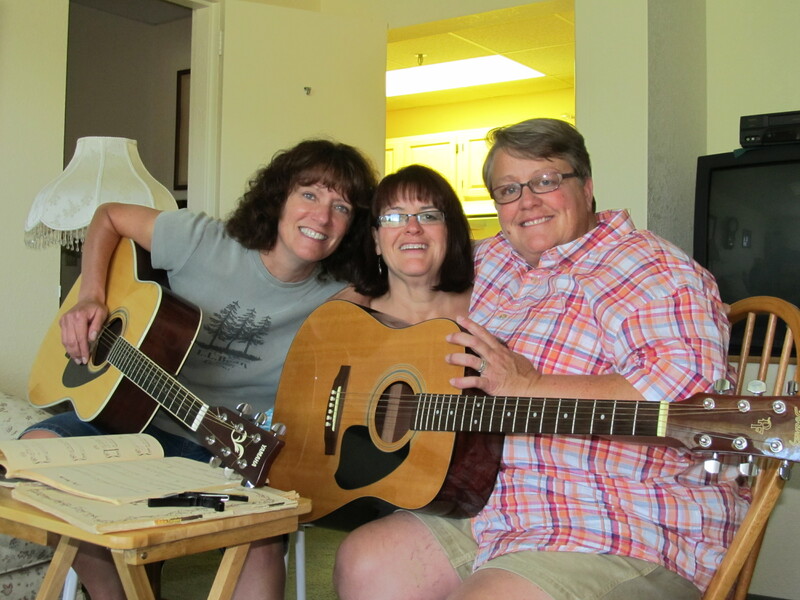 In a wonderfully serendipitous moment, a woman in the group chose to share her life story. It was one of transformation and self-discovery after a painful beginning which included alcoholism and low self-esteem. Her turning point came after watching her daughter succeed in breaking the example provided by the two preceding generations of her family. This woman revealed, fresh petal by fresh petal, the new person she is becoming, the beautiful new life she is creating. It was both inspiring and moving to be part of that moment. Which offers a real contrast to my current state, because today a flower frozen in mid-bloom feels like an appropriate metaphor for where I am in my life. I was like a tightly closed bud, carrying the potential to bloom, but waiting for the right combination of sun and rain and nutrients to open. In the past year and a half, I have felt myself opening, one petal at a time. Most of the time in recent months, I have felt the energy of new life in my veins. I have literally felt growth and movement. This week, I feel like I’ve run out of juice or as if there isn’t enough sunlight to produce the necessary photosynthesis (I’m sure I would be applying this metaphor more gracefully if I had paid attention in high school biology). The petals that have opened are lovely and I am proud of them. I very much wish the rest to open so I feel both wholly lovely and more complete. Less unfinished. But I suddenly find I am casting a shadow over myself, blocking my own sunlight: through procrastination, through permissive self-talk (“go ahead, eat that donut/cookie/whole package of rice thins, it won’t hurt this once”), through choosing not to follow through. By letting myself off the hook. I’m not sure how to unfreeze from this weird stasis I’ve entered into. Perhaps I just got distracted by how pretty those first open petals are – like Narcissus, who fell in love with his own reflection, I’ve spent too much time in awe of myself, congratulating myself on what is done. And now, realizing that I still have half my blooming to do, I vacillate between impatience and paralysis. One thing I do know for sure from sad experience as a child: you cannot force a flower to bloom by prying its petals open. Just wanting it isn’t enough, either. I will have to get back to holding myself accountable, though right now that feels almost insurmountably hard. This isn’t going to be one of those blog posts where I tie things up neatly with a final statement of what I’ve learned or an inspirational quote. Instead, it is one of those posts where I end with a shrug and say, I’ll let you know what happens next. Anyway, all of that is a rambling introduction to a coincidence which occurred today. Saturday morning, and I was doing anything to delay heading to the gym. So I engaged in my favorite tactic: I checked out my Gmail inbox. There was a new post from a blog I follow (and have mentioned before) Spiritual Travels. Today’s post describes her thoughts about the apostle Paul, while visiting Ephesus. She concludes the post imagining Paul in his modest home in Ephesus, writing his first letter to the Corinthians, which contains his oft-quoted verses on love. (See them here) Like many, I have always loved these verses. I like hearing them read at weddings, though I believe what Paul referred to was so much bigger than the love between two people — that everything we do must be animated by love to be worthwhile, that love is more than an emotion, it is a high standard to which we should aspire. 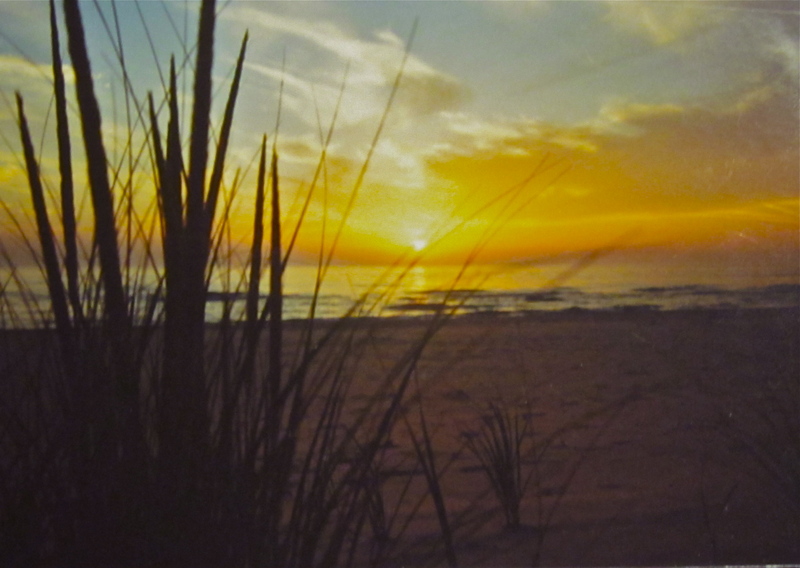 “…As spring’s wonders arise from winter’s hardships, we are invited to reflect on the many “both – ands” we must hold to live life fully and well — and to become more confident that as creatures embedded in nature, we know in our bones how to hold them.